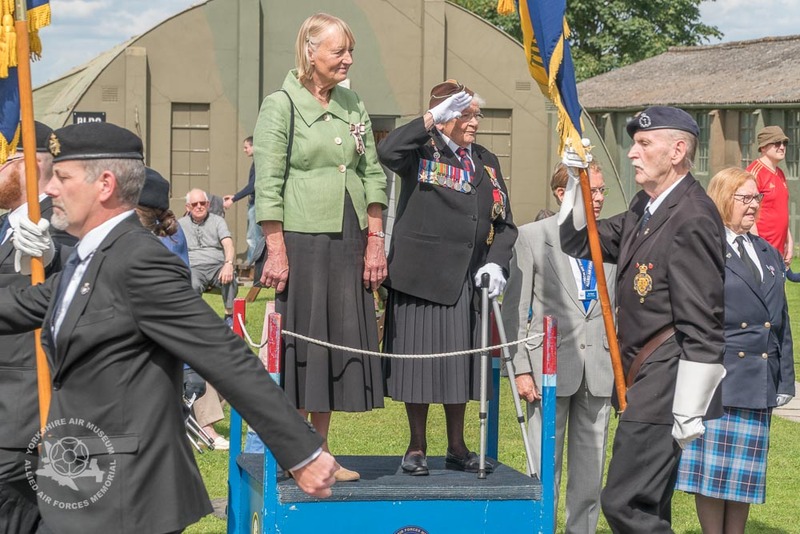 The Centenary of women serving within the Armed Forces was marked during the poignant Women’s Services Memorial Day which took place here at the Allied Air Forces Memorial & Yorkshire Air Museum on Sunday. Sunday’s ceremony was especially poignant, as it saw the Laying Up of the Branch Standards of Keyingham and Stamford Bridge Royal British Legion Women’s Section, making this the last time that these Standards were presented and paraded. This is always a sad occasion, as these flags were a symbol of service and friendship, carried and marched with pride and honour. Taking the salute was Lord Lieutenant of the East Riding of Yorkshire, the Hon. Mrs Susan Cunliffe-Lister, joined by former ATS Barbara Weatherall from Selby. Barbara served as an air defence gunner and military driver throughout the second word war, joining the ATS at the age of just seventeen. At the age of 92, she is still full of life and enjoyed talking of her wartime experiences in the Yorkshire sunshine. The parade was led by Yorkshire Military Band and Corps of Drums, creating a rousing and colourful spectacle for all participants and visitors to enjoy, followed by a beautiful flypast from the RAF Battle of Britain Flight’s Spitfire. In today’s world, women serve equally alongside their male colleagues across all branches of British military forces, but it was not always this way. It was on 7th July 1917 when the Women’s Army Auxiliary Corp was formed, officially introducing women into the Army for the first time. This was followed in November 1917 by the formation of the Women’s Royal Naval Service and the birth of the ‘Wrens’, as the service is affectionately known as. This annual Service and Wreath Laying Ceremony exists to pay tribute and fully recognise the role that women have played in the defence of the nation from the First World War to the present day, where they now take on frontline duties, shoulder to shoulder with their male counterparts on the ground, at sea and in the air. Each year, the event grows in popularity with Museum visitors as we celebrate the modern equality in our armed forces and remember those who served in the very early times of female military service.